To keep your vehicles on the road and productive, it’s crucial to have a well-run maintenance program in place. But before the first vehicle rolls into a garage, there’s a step that you must take — establishing your maintenance goals. 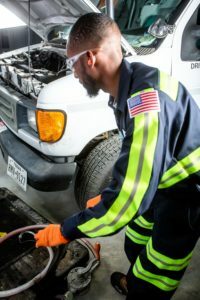 It goes without saying that your maintenance goals should be aligned with the realities of your operation — including the type of work the fleet does, working conditions (e.g., on-road or off-road), and weather (e.g., hot, dry or cold, wet conditions). How often do you expect to have a vehicle out of service for a typical preventive maintenance? How will routine, preventive repairs be handled? How will emergent repairs be handled? The answers to these questions will help you set the parameters for success. For example, if uptime is one of your maintenance goals, developing a strong preventive maintenance program will be essential. Preventive maintenance is inextricably linked to uptime, but, as Amerit has discovered, it’s much more than simply scheduling a service — it needs to be implemented using stringent parameters. For example, one of Amerit’s goals for its clients is a Predictive PM program that results in not seeing a vehicle in the shop between scheduled PM service dates, resulting in maximum uptime and minimized maintenance costs. Your maintenance goals, no matter what they are, should include essential basic elements such as: emphasis on safety, implementing a strong PM program, hiring the best technicians available, and limiting outside spend. Amerit’s world-class PM program is built around these basics and designed with the tightest parameters possible, which it closely monitors to make adjustments based on PM success and failure rates. Amerit has identified the top 10 components to transform a “good” maintenance program into a best-in-class maintenance operation — developing a Proactive PM Program is #3 on the list. Drawing on its nearly 20 years of serving clients nationwide, Amerit has developed unique secrets for maintenance success that it is sharing with fleets for the very first time.